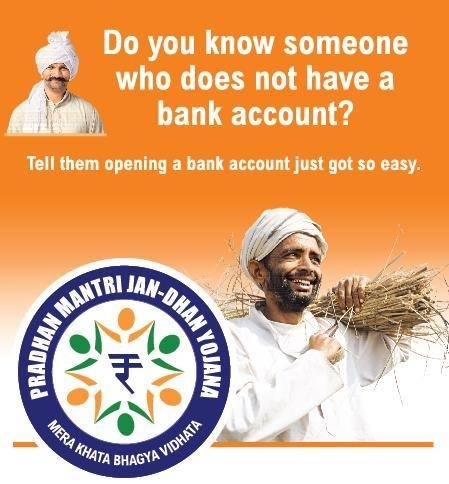 Pradhan Mantri Jan Dhan Yojana (PMJDY) is a nationwide scheme launched by Indian government in August 2014. In this scheme financial inclusion of every individual who does not have a bank account is to be achieved. The scheme will ensure financial access to everyone who was not able to get benefits of many other finance related government schemes. These financial services include Banking/ Savings & Deposit Accounts, Remittance, Credit, Insurance, Pension which will be made available to all the citizens in easy and affordable mode. According to the data issued by finance ministry, till September 2014 around 40 million (4 crores) bank accounts have been opened under the Pradhan Mantri Jan Dhan Yojana since the scheme launched. However there was another financial scheme (Swabhimaan) launched earlier in which the target of opening the bank accounts was for villages only. But in Pradhan Mantri Jan Dhan Yojna the entire individuals irrespective of their area (rural or urban) can get a bank account without depositing any amount if they fulfill other eligibility criteria. This scheme is very beneficial for the rural population where banking services and other financial institution are rarely available. Under the Jan Dhan Yojna anyone who is India citizen above age of 10 years and does not have a bank account, can open the account with zero balance. Account can be opened in any bank branch or Business Correspondent (Bank Mitr) outlet, specially designed for the purpose of opening the accounts under this scheme. The scheme also provides facility of accidental insurance cover up to rupees one lac without any charge for the account holder. The account holders under the jan dhan yojana will be given a RuPay debit card which can be used at all ATMs for cash withdrawal and at most of the retail outlets for making transaction for purchases. The Pradhan Mantri Jan Dhan Yojana or more popularly known as PMJDY scheme is planning on revolutionizing the traditional banking system in India by providing the banking opportunity and insurance coverage to all including the poor. It is an initiative taken by the Prime Minister Narendra Modi who started this ambitious project to help the poor become more financially confident through this venture and allowing every citizen the right to have their own bank account and insurance coverage which was previously impossible for most of the population under poverty. The purpose of this scheme will definitely benefit the overall economy of the country and the scheme provides some lucrative benefits which should certainly be availed and considered. Here is listed some important benefits of the Pradhan Mantri Jan Dhan Yojna (PMJDY) scheme which would certainly inspire the country to a more prosperous future for all. Under the PMJDY scheme the account holders will be given worth Rs.30000 insurance coverage if they comply with certain specification of the scheme which includes opening an account by January 26, 2015 and having an accidental insurance coverage of over Rs. 200000. The account holder can take loan benefit of up to Rs.5000 from the bank after six months from opening the account. Though the amount might seem insignificant for many but we have to realize the scheme is directed mostly towards people below the poverty line and who are struggling desperately to sustain their everyday living. The loan benefit can be a scintilla of hope for those people who could utilize the loan amount and invest it in a more profitable outcome, particularly in farming or other agricultural prospect. Though the technology of using smart phones to conduct our bank transactions is not novel anymore but the PMJDY scheme will allow its account holders to avail the same facilities of checking balance and transferring funds through a normal cell phone which is more affordable to the general economy. Hence PM Jan Dhan Yojana is indeed a prosperous venture and we certainly hope the Prime Minister and the mass economy are both benefited through this new venture.